We spent yesterday doing an all-day tour of the exclusion zone around the Chernobyl Nuclear Power Plant organised through a local tour agency. Visiting the area has been on my bucket list for a long time, and I can report that it was everything that I hoped it would be. 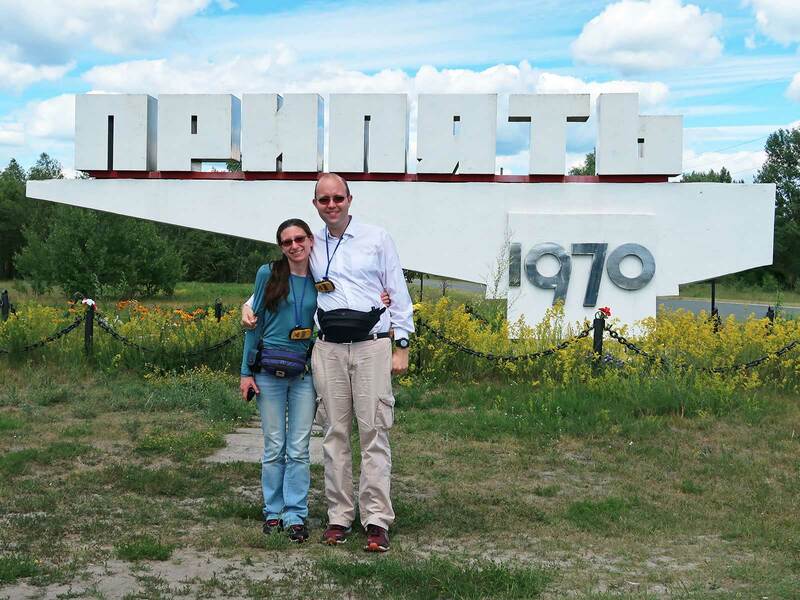 We were able to walk around the village of Zalissya, the town of Chernobyl, the town of Pripyat, and right next to the new safe confinement over the remains of the failed reactor at the plant itself. There was even time to visit Duga-1, an enormous radar installation designed by the Soviet Union to detect inbound American missiles. While I would not want to visit the zone every day it's worth noting that the cumulative radiation exposure over the day was less than one receives from an hour on an airplane, and a negligible health risk given the amount of time I spend flying. An afternoon flight home from Kiev gave us a few hours in the morning for one last tourist attraction, and we decided that the best choice for us was Roller, a half-kilometre long coaster zipline located at the edge of Holosiivskyi National Nature Park, a forested reserve in the outskirts of the city. The concierge at our hotel warned us that our target was designed for children, and that it had a ninety kilo weight limit. This made me wonder about the obesity epidemic plaguing the world, as the thought of children who weigh that much is slightly terrifying. There was a cash booth next to the start point of the line, which is priced at 120 hryvnias on weekdays and 180 hryvnias on weekends. From there it was a short walk up three flights of stairs to the load platform, where the required equipment was waiting. Once harnessed the staff member at the top gave me a strong push to get the ride going, and for the first few seconds it felt like the experience would be a good one. Unfortunately the rest of the descent was very slow indeed, to the point that there were a few stages where it felt like I might get stuck. The experience was definitely in the family category; it would have needed to have been twice or three times the speed to be worth repeating.